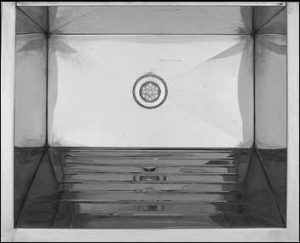 Fabricated wash troughs are made from grade 430 stainless steel which is not as strong as grade 304 products. Although not as strong, they are ideal for residential and light work applications. The fabricated wash troughs are mostly used in large projects or as an affordable large wash-up sink outside the house. Minimum orders are applicable to the ET101 and ET103 units however there are alternatives also available (please send us an email). 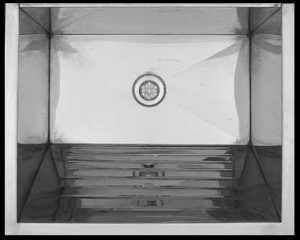 *WARNING: The economy type wash troughs are not recommended for coastal, heavy duty or severe corrosive applications. Refer to Luxtub models for these applications. Specification: ET101 Fabricated Single Wash trough. 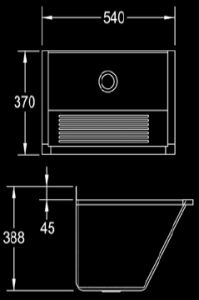 Franke Model ET101 Single Fabricated Economy Type Wash Trough, 542 x 440 x 388 mm deep. Unit to be manufactured from Grade 430* (17/10) Stainless Steel, 0,8 mm gauge. Unit to be manufactured with a sloped front, with wash ridges and a 40 mm waste outlet. Trough to be supplied with fixing lugs to mount the trough to the wall. (Bolts elsewhere measured). Minimum order of 10 units only.